Left and Write: "Be Prepared, Son. That's My Motto. Be Prepared." "Be Prepared, Son. That's My Motto. Be Prepared." The above line is from one of my favorite movies. A movie that I find to be one of the true, underrated, classic films of the early 90s. When I saw Alex J. Cavanaugh's Underrated Treasures post, this film was the first thing that popped into my mind. 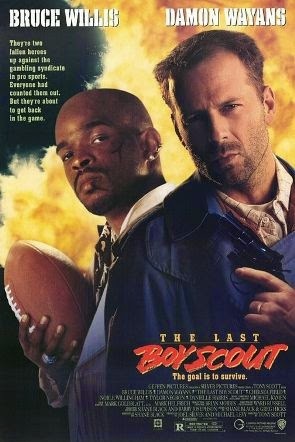 Starring Bruce Willis as his usual, down and out-type character....ex-Secret Service agent (for President Carter...hey, it was the 90s) / do-gooder turned private investigator and Damon Wayans as Jimmy Dix, an ex pro football player who was fired for snorting his paychecks, The Last Boy Scout was one of those quirky films that, sort of, sneaks up on you. I had never even heard of this movie before seeing it at Blockbuster (yes, I first saw it on VHS...hey, it was the 90s). The advertising budget must have been minimal, even with headliners like Willis and Wayans....who weren't exactly Hollywood lightweights back then. I also don't remember ever seeing any trailers for this at the movies. This is the "ignorant bliss" we enjoyed back in those pre-internet days. There were quite a few stars in this one, as well. Halle Berry, Billy (Tae Bo!) Blanks, and Bruce MacGill had small parts and Noble Willingham (You'd know him if you saw him) played the 'baddie'. There is one, though, that I can share. Wayan's character screaming at Willis' character as they engage in a car chase. "Joe if you go any faster, we're going to travel back in time!" It's your typical action/dramady genre film, but one that impressed me so much because it, sort of, just appeared. Besides my circle of friends, I rarely come across anyone who has even heard of it, much less seen it. Truly, one of the underrated treasures, in my book. I'd heard of it, but didn't know much about it. I think we've all got a film like that, that feels like it's just ours and no one else's! The Husband loves this movie too. Then again, just about anything that has Bruce Willis in it, he loves. "If you go any faster, we're going to travel back in time!" Heh, heh, heh. This sounds like it would be a fun one to watch. Oh yes, this is a good one!! I've heard about this movie, but have never seen it. Thanks for sharing your movie pick for the Underrated Treasures Blogfest. Great movie! So brutal and raw. But the line about the $650 dollar leather pants and did they come with a television set was priceless. I HAD to come here first, because I knew you'd have something awesome to share. I have heard of this movie, but haven't seen it. Now I must go find it... Thanks for sharing! I saw it once on TV so it was probably cleaned up a little. Our family has quotable movies too. Oh. Bruce Willis. What would we do without him? ;) I enjoy his movies. And his bald head. I will literally watch anything with Bruce Willis in it. I LOVE him. Great choice. I suppose when you go really fast, you can travel back in time, or you might go into the future. I've never gone that fast, so I wouldn't know. Thanks for sharing your pick, Mark. I don't think I had even heard of this movie. Thanks for sharing! Don't know this movie but sounds like one me and my dad can watch together. He is a huge Bruce Willis fan. I'm a fan as well. And the Wayans family just oozes talent. Bruce was so cool in this film, even though he got shat on for most of it. Never even heard of it. Thanks for educating me. I know I saw this and I remember laughing, but I can't remember the story. I hate it when that happens. I'm surprised I've never heard of this one. Sounds like one my dad would like. I should rent it sometime and watch it with him. Well well well, here is one movie I actually saw! Great choice, Mark. This sounds hilarious. I love a quotable movie! Hey, I've heard of this one...I think. It's kind of fun for you and your cirlce to have it as your own inside joke sort of thing. I've only seen bits of it but I'll have to give it another try. Halle Berry? Got to love Bruce Willis. He's from very close to my hometown so I'm always pulling for him. Must check out this movie, maybe on NetFlix. Thanks for sharing because I had no idea of its existence, like many other treasures I've found through participating in this blog hop. Totally agree. Very good movie. Practically Die Hard in all but the title.